BBC News is tracking BBC Box (a standard 40-foot long shipping container) since September 2008 to understand sea trade in the global village. Regular updates on the whereabouts of the BBC Box were available in BBC News website. For the last few months, due to failure of GPS tracking device in the BBC Box, updates are done manually. As BBC Box is having a code number (NYKU8210506), it can be located through Nippon Yusen Kaisha (NYK) Line’s container tracking. 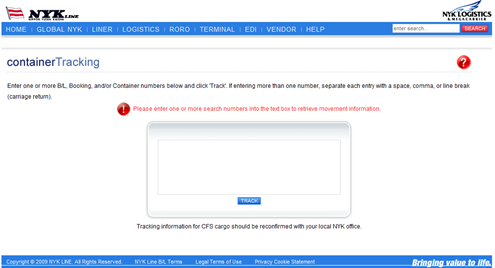 Click the image below, enter the BBC box code number:NYKU8210506 in the container tracking window and click ‘Track’. You will get the result displayed immediately on the screen as shown below.